There are three main party resorts on the island; San Antonio, Playa d'en Bossa and Ibiza Town, so here are a few foolproof tips on how to get around the White Isle stress free. From San Antonio, you can catch a bus to any of the superclubs from the main bus station (see map below). From Playa d'en Bossa it's any stop that has the Disco Bus motif stuck to it (pretty much every one), but most people tend to hop off at Ushuaïa where the bus stops right outside. Departing from San Antonio every half hour, a one-way trip costs between €3 and €3.50 a barrel of laughs! No glass bottles are allowed so maybe leave yourself a few minutes before you leave your apartment to pour your beverage of choice into a plastic bottle. Folks on the disco bus are usually pretty excitable, which is just as it should be, but it pays to remember that a) not everyone on the bus is on their way to or from a party and b) bus drivers have breaking points too. So please keep it clean - in every sense of the word. The two clubs that might catch you off guard when it comes to actually getting off the bus are Amnesia and Privilege. Both are on the highway between San Antonio and Ibiza Town. Amnesia's stop is quite hard to miss, look out for the flags, the bridge and the massive billboard that displays the night's festivities. Privilege (looking like a golfball roof at the top of the hill) is a bit more of a devil - the first time I went to the venue I got off the bus a stop too early leaving me to walk 15 minutes down the highway. Always keep an eye out for the white arched gated entrance to the road which takes you up to the club (on your left). You'll get to it just after the tunnel (from San An) and naturally just before it if you're coming from Playa d'en Bossa or Ibiza Town. It is right on a main roundabout and the bus will stop just before this, meaning you have to cross the road after leaving the bus. If you are unsure, ask around, and the driver always always shouts out each stop/club... so be aware. For Pacha, the bus will stop around 10 metres beyond the club. You really can't miss it - it says Pacha outside and looks like a club. Regardless of where you need to be, over the ruckus you'll hear the bus driver yell out the name of the clubs, so listen out when those compulsory stops are made. Please note, for Santa Eulalia and Es Cana, the Discobus runs regularly between 24 June and 10 September, and then less frequently until 2 October. All disco bus routes stop on 1 October, so you might find the following transport options useful! Read on. MAP | The San An bus station, for all buses including the disco bus, is just beyond the row of buildings behind the Egg roundabout, the roof looks like a massive cheese wedge/spaceship from Star Wars. You can't miss it. MAP | The Ibiza Town bus stops. Here you can see the main bus stops on Av. d'Isidor Macabich, then the disco bus stops by the Marina/outside McDonalds, and the disco bus stop by Pacha. For Ibiza Town you pay for all bus routes directly on the bus. MAP | The Playa d'en Bossa bus stops. You can see the main stop just outside the football courts next to Ushuaïa. There are further stops along the road, near Bora Bora, also. So, the late night disco buses are out of the way, let's move on to the regular buses that operate all throughout day. If you don't have enough holiday budget to afford whizzing round in a taxi (me), or you haven't got that precious pink driving licence yet to get your mitts on a scooter (me, again), it's time to embrace your repressed memories of the school bus and all the mega-lols you had on there as a kid. Air-conditioned and regular, Ibiza's buses run from around 7:00 until 23:45, when the disco buses take over. 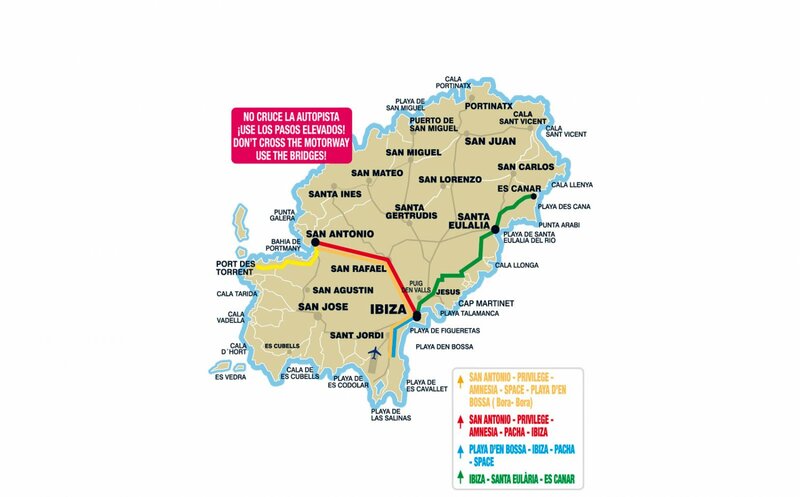 There are half-hourly connections between the major resorts but 30 minutes does not seem at all long, especially when journeys between Ibiza Town and San Antonio are only €2. The best place to jump on board in San Antonio is the very modern bus station (see map above) and in Playa d'en Bossa there are several bus stops along the main strip that runs parallel to the beach and past Bora Bora, Jet Apartments, Ushuaïa and Space, whilst the main bus stop in Ibiza Town is on one of the main arteries out of the town - Av. d'Isidor Macabich. You can buy tickets on all of the buses. Happily, you can also get the bus directly from San Antonio to Playa d'en Bossa, and vice versa. These buses start at 4.15 PM and run every 45 minutes. Rules are rules and many buses, particularly to and from Ibiza Town, won't let you board wearing a bikini or without a top or t-shirt. If you are heading to the beach this way make sure you pack a kimono or bring a t-shirt with you. See here exact dates on which the disco bus runs. For a full list of bus timetables for you extra organised people see the Ibiza Bus Company website. If a scooter or quad is on your Ibiza bucket list you can find hire places in every town, so make sure you shop around a bit first to find the best rental prices. They're great little vehicles for exploring the island and are easy to park, just make sure you wear your helmet at all times. Not only is it for protection, you could find yourself being slapped a €200 fine if you get caught without one. Helmet hair, what helmet hair! For all the information you need on hiring a scooter, please head HERE. Taxis can be flagged down at any time of the day or night as long as the green light on their roof is showing. There's a taxi rank in San Antonio at the bottom of West End, along the main road in Playa d'en Bossa and on Avenida de Bartomeu de Roselló, just up from the Marina. Playa d'en Bossa to Ibiza Town costs around €15, it's around €30 between Playa d'en Bossa and San Antonio and San Antonio to Ibiza Town is €25. All taxis work on a meter basis but it's always a good idea to ask roughly how much it's going to be so you don't get caught short. For all the information on taxi fares, please head HERE.